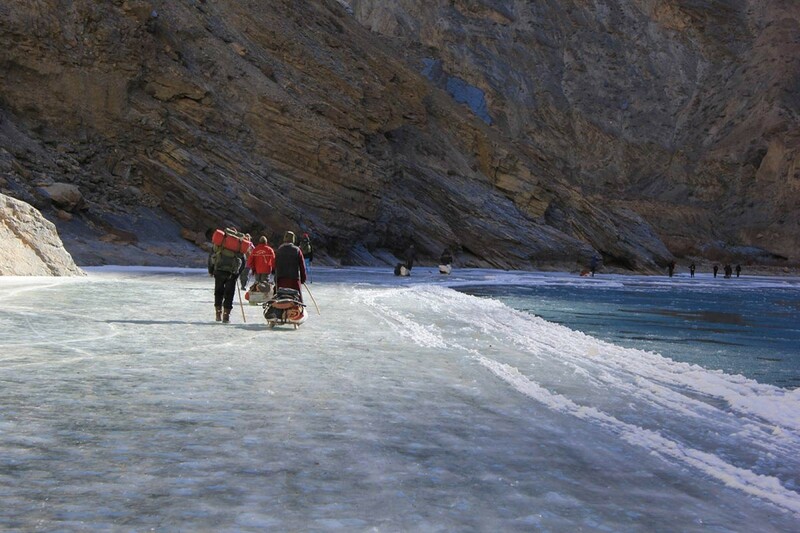 Trek over the frozen Zanskar River as it twists and turns across Ladakhi mountains for a riveting 11-day Chadar trek. This adventure promises to showcase the gorgeous and arid landscape of Zanskar, with frozen waterfalls, barren mountain cliffs, ancient caves and rugged canyons. You'll spend days trekking over the thick layer of ice, blanketing the Zanskar River, and camp at night besides the river's turquoise waters. A truly once-in-a-lifetime experience, the Chadar trek ranks as one of the most celebrated treks in the India. This itinerary of the Chadar trek takes you a step beyond to visit the campsite and village of Lingshed. 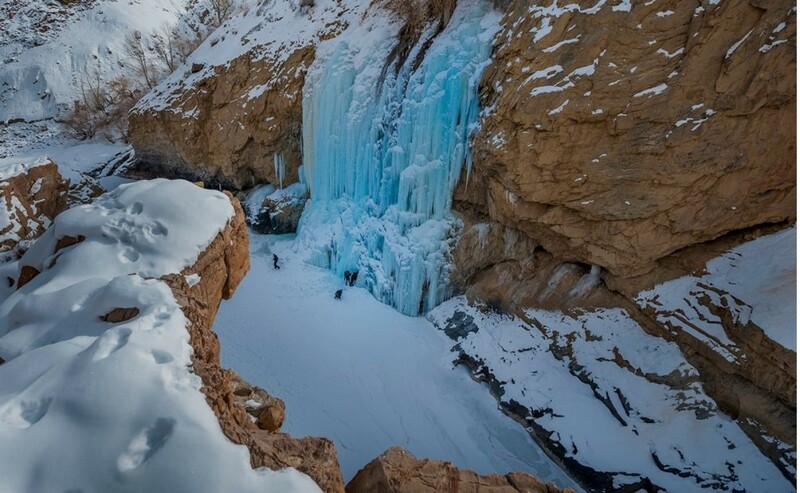 A breathtaking adventure at over 11,000 feet in Ladakh, the Chadar trek requires travellers to spend hours walking over the frozen river in sub-zero temperatures. 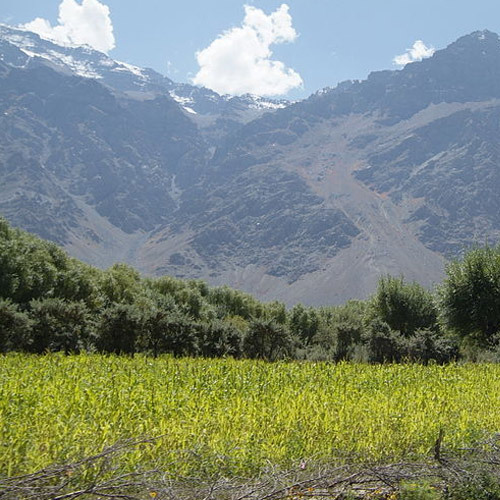 | If you are not cleared in the medical test in Leh, you will not be allowed to join the trek. There are NO refunds in this case, and the operator will not be liable to make alternate arrangements for your time in Leh. 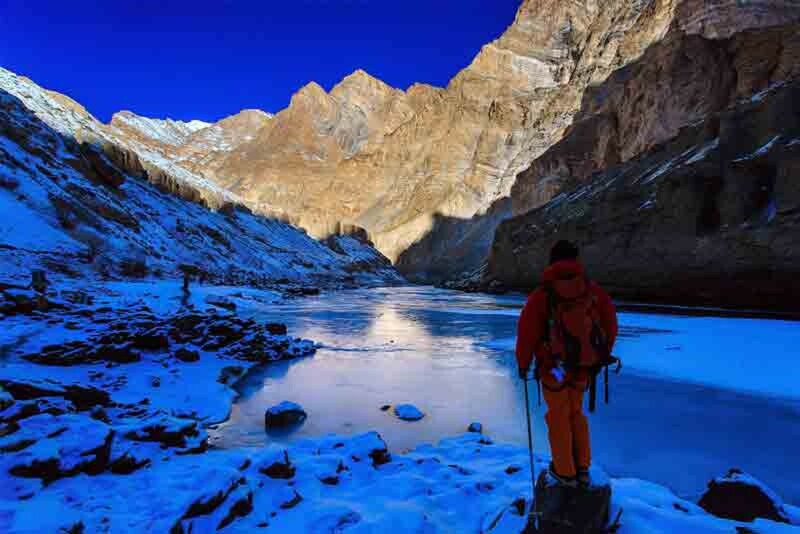 Embark on the Chadar trek, one of the most distinguished treks in Ladakh, and walk over the frozen Zanskar River. For eleven-days in the white, winter paradise of Ladakh, you'll get the complete Chadar experience, including a visit to the remote town of Lingshed. 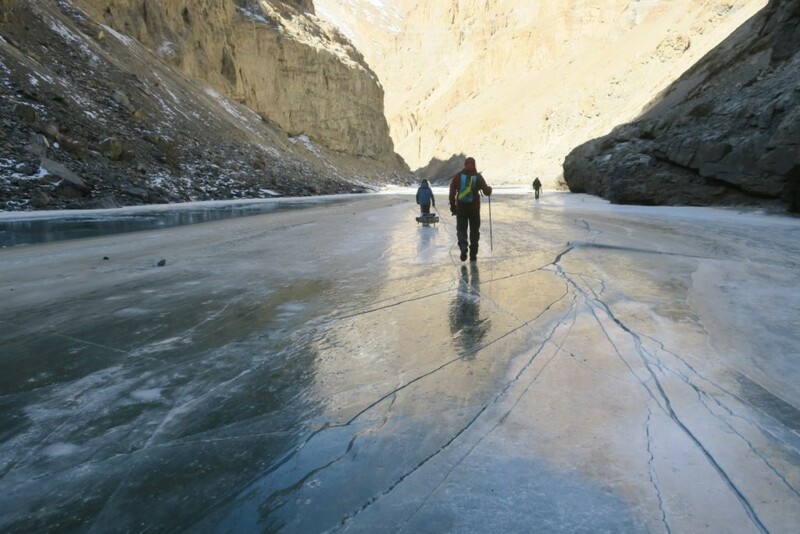 En route, you'll tread over the creaking sheet of ice over the Zanskar River and make your way across frozen waterfalls, gurgling river streams and giant boulders. 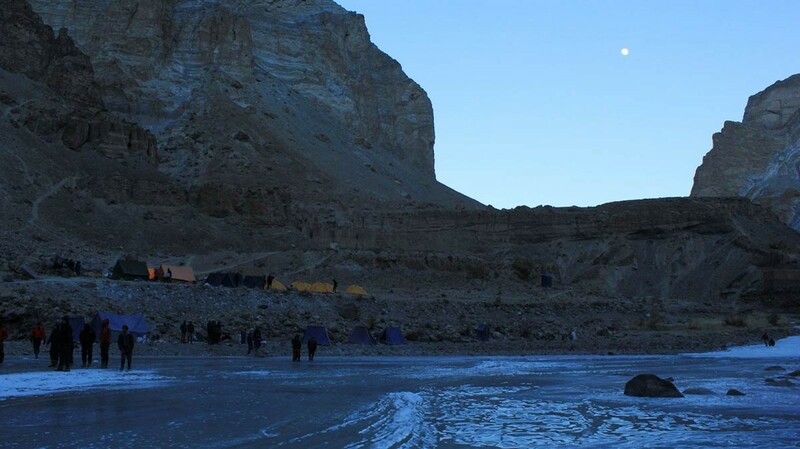 Making your way through the unusual terrain, you'll spend the night in tents, pitched near ancient caves and iced gorges on the banks of the Zanskar River. As the mountains roads of Ladakh are snowed in over the winter, the locals have traditionally used the frozen Zanskar River to travel between villages. Today, the route followed by the locals is renowned as the Chadar trek. 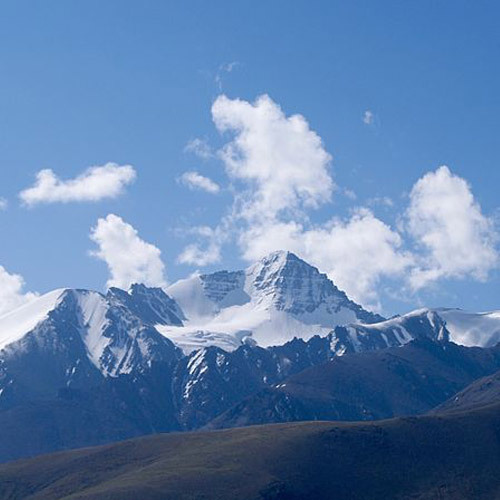 | If you are not cleared in the medical test in Leh, you will not be allowed to join the trek. There are NO refunds in this case, and the operator will not be liable to make alternate arrangements for your time in Leh. Embark on the iconic Chadar trek, one of the most celebrated treks in the Indian trekking community, on a unique and little-known itinerary. For 12 days spent deep inside the Zanskar valley, you'll trek over the frozen river of Zanskar, stay in tents beside the turquoise river, hike across frozen waterfalls and explore a terrain of barren rock-faces, narrow gorges and rugged mountain slopes. With a creaking sheet of ice underneath your gumboots, you'll trek to grab some of the most extravagant views of the Ladakhi mountains. While most travellers to the frozen river only trek till Nyerak Pulu, you'll continue deeper into the valley to visit the small village of Zangla. Here, you'll spend a day living with a local family and embark on day trips to visit the Padum marketplace and Karsha Monastery. A riveting adventure at more than 11,000 feet in the mountains, the Chadar trek is only recommended for travellers with previous experience of at least one high-altitude trek. 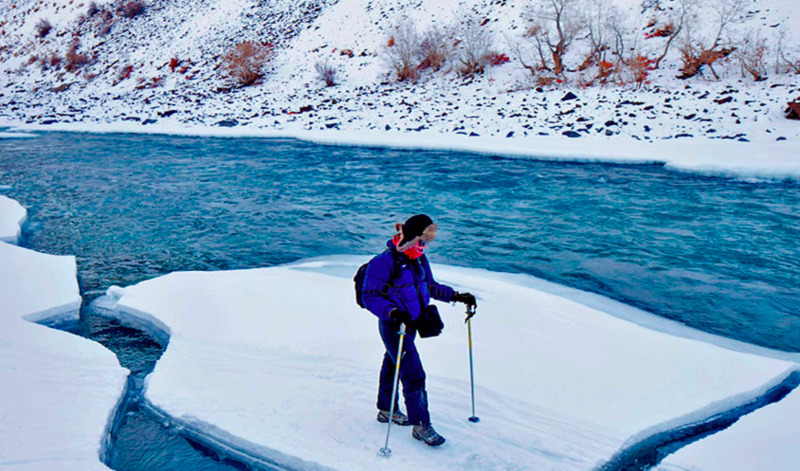 The Chadar Trek is a once-in-a-lifetime opportunity where you can experience the thrill of walking across a frozen river. 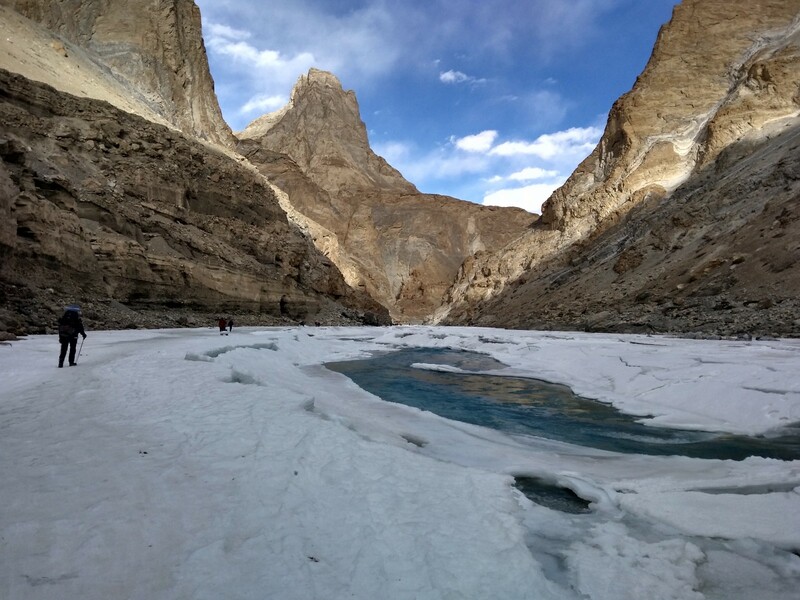 This trek offers stunning views of the river, changing from blue to golden yellow to milky white, as well as the rigid rock faces of the landscape.The Zanskar river meandering through narrow gorges freezes over in the winter months, resembling an unending blanket of snow; hence the name 'Chadar'. 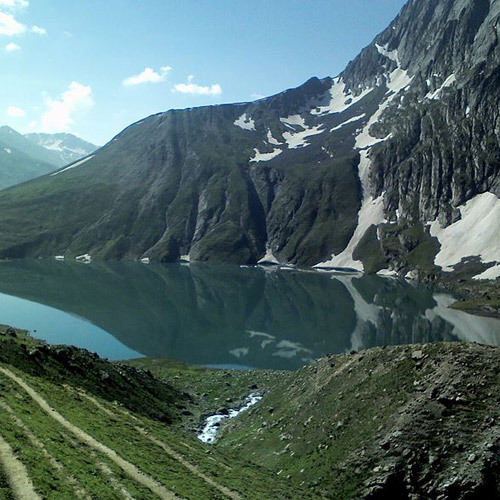 This is a high intensity trek suitable for those with some trekking experience. 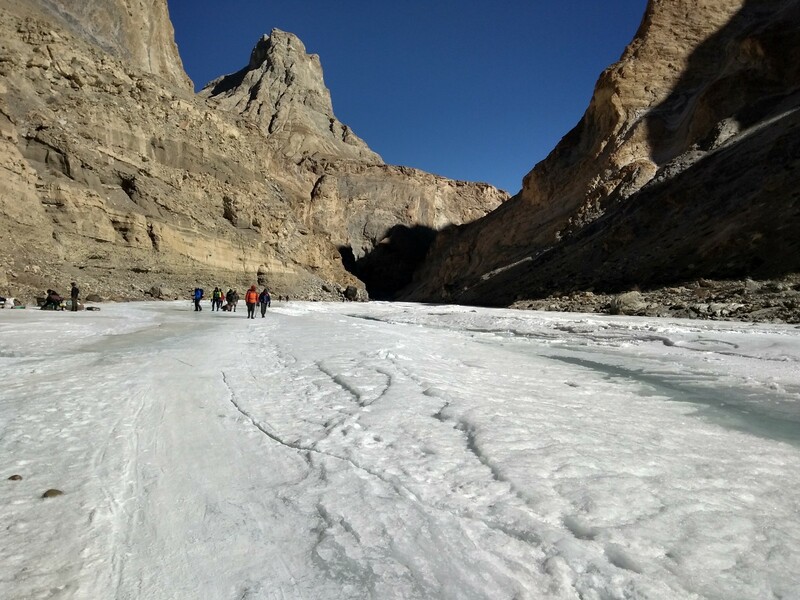 Join us on a trek to the beautiful frozen Zanskar river. This is often called the 'Chadar' trek because of the semblance of this frozen river to a snowy blanket meandering through Ladakh. This is a high intensity trek and is only suitable for those who have significant trekking experience. The trek involves exposure to extreme cold temperature such as minus 13 degrees celsius (day) and minus 30 degrees celsius (night). The trek is on a frozen river at high altitude and the maximum height reached will be approx 11500 feet. Hire charges for Sleeping bags and feather jacket. 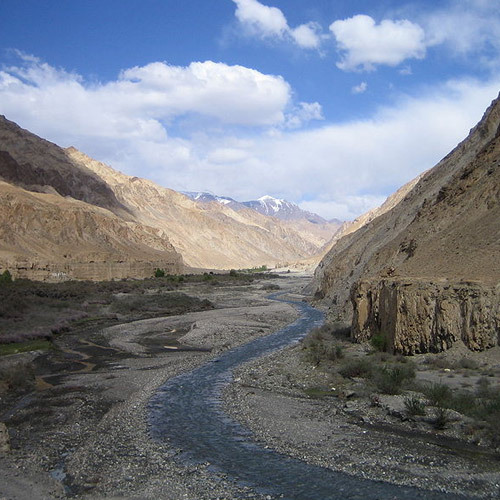 Over hundreds of years, the Zanskar river has carved a path for itself through the rocky gorges of Ladakh. The walls of the gorges can go up to 2000 feet tall in some places. 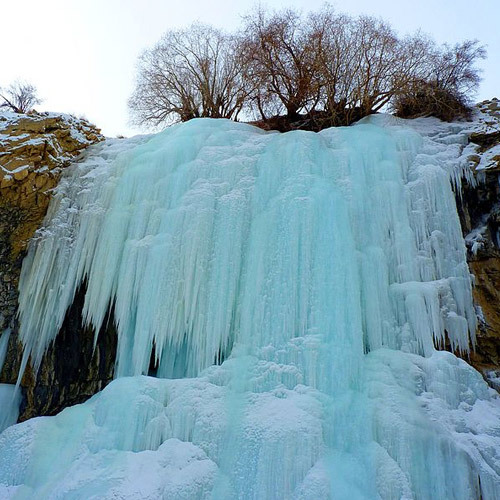 During the summer, the river is a perfect location for rafting, and during the winters it transforms into a sheet of ice. The ice on the river forms such a thick layer that the locals use it as a road. You’ll be walking on this icy sheet for your trek. What the Chadar trek is like! This thrilling trek involves walking on the frozen Zanskar River, camping in an icy wonderland, and discovering the dramatic beauty of a winter landscape. Through much of the trek, steep canyons accompany you on both sides. Sometimes the canyon walls are the only support you have as you make your way across the sheet of ice, with a raging river just beneath. At night, you camp in tents on ice or in ancient caves. The trek is a unique journey that is on the bucket list of almost all trekkers. While it's a valley trek across flat ground that doesn't take a toll on your legs, it's the temperature that you need to get used to. You walk in sub-zero temperature during the day and sleep in temperatures that can reach -25 degrees. Although the trek has gained popularity in recent years, it is still an isolated place where you and your team might be the only people as far as your eye can see. If you’re thinking of doing the Chadar in trek, here are the top five reasons you definitely should. 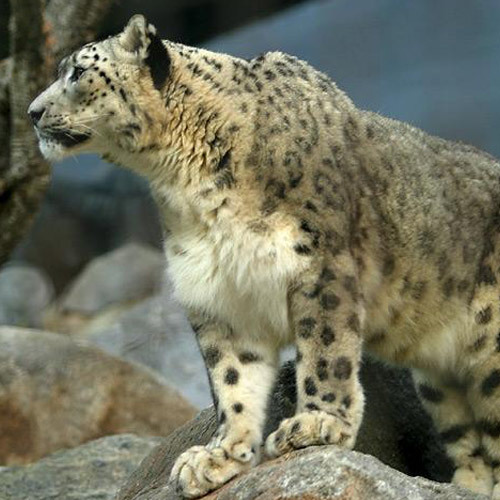 You can choose from whirlwind itineraries of the legendary frozen Zanskar river trek that give you a taste of the experience, without taking too long. It's perfect for those who are not sure they'll be able to handle longer durations in the freezing weather, or for those who have time restrictions. There are also longer itineraries that gives you enough time to acclimatise before heading out to take your first steps on ice. Here is a complete list of things to carry on the Chadar trek. NOTE: All departures for Chadar trek 2019 have a compulsory medical check-up in Leh. This is to ensure that you are fully acclimatized and fit to undertake the trek. Read a complete list of things you should know about the Chadar 2019 trek before you book. What will the weather be like on the Chadar trek? The Chadar trek takes place in the coldest time of winter so that the Zanskar is completely frozen and you can trek on it. You can expect days to be anywhere between -5 and -10 degrees Celsius. However, at night it can drop drastically, going to -15 to -20 degrees Celsius. During the day, it’s not difficult to stay warm while you’re walking, but once you arrive at camp, you’ll start to feel the cold. Make sure you have the right thermals, fleeces, jackets, and hats, socks, gloves, etc. Is the Chadar trek dangerous? There are risks in any adventure sport, but with qualified and experienced guides, a strong support staff, and the right precautions, you should be safe. The most common risk on the Chadar trek is altitude sickness. You can avert ill effects by making sure you stay warm and hydrated, follow the instructions of the guide at all times, don’t exert yourself on the first two or three days, and alert your guide if you’re feeling sick or unwell. If you want to know about high altitude trekking, read How to prepare for a high altitude trek. What gear should I carry for the Chadar trek? Your operator will provide you with a complete list of gear to pack. Make sure you go through this and take each item. Talk to your operator to ensure you get the right quality, and check all your gear before you leave home. It’s always a good idea to break in your trekking shoes so you don’t suffer blisters on the trek. You can read this complete list of items to pack for the Chadar trek but do follow your operator’s list to the word. Can I go as a first-time trekker with no experience? It is not recommended to go for the Chadar trek if you have no prior trekking experience. This is not because the Chadar trek requires any technical skills – it doesn’t – but you will have to trek in harsh conditions, in a remote location. You might not be prepared for the cold, or you might not like the camping and toilet arrangements. Instead, you could try starting off with a short snow trek in Uttarakhand instead, and aim for the Chadar trek in 2020. Having said that, there are some fit first-timers who have been on the Chadar trek, and have come back delighted with the experience. It depends on your fitness levels, having realistic expectations and the right attitude, and being mentally resilient.